← Are You Financially Ready For Kids? A couple of months ago, I ran out of kitchen cleaner in the middle of my big cleanup and didn’t want to use just water. I wanted to be able to kill that bad bacteria but had my gloves and “cleaning clothes” on so running to the store would have been a big chore. Instead of going to the store, I used a search engine to look up what else I could use as a cleanser instead of the sprays that you can buy at the supermarket. I was on the computer for quite awhile after initiating that search, because what I found was alarming. The research is overwhelming; store-bought, unnatural cleansers are terrible for the environment, your health, and even some of your home’s more precarious systems. I think we all know this inherently. We know that breathing in cleaning chemicals can’t be good for you, but it’s easy to ignore that when you have soap scum in your bathtub. Chemicals in cleaning products can be linked to increased instances of breast cancer, memory loss, “superbugs” and many other problems. Wearing a mask when using these products in your home won’t be 100% effective, as they are still bad for the environment. Furthermore, these household cleaning products can be very damaging to the balance of good and bad bacteria in a septic system, which is very expensive to have fixed. I found some great, green, natural alternatives to cleaning chemicals that you may have in your cupboard already. Lemon’s acidity and naturally nice, fresh aroma makes for a great cleaner. The same goes for some orange products, but lemon is the most commonly used. If you have a fresh lemon, cut it in half and microwave it. The juices will be released from the lemon during the microwaving, and all you have to do is wipe the microwave down. It will smell nice and the vapor from the lemon lifts microwave grime right off. Lemon can also be used for cleaning the bottom of pots so that the crud that gets cooked on will come off. Try a half a lemon on your barbecue to get rid of build up and cooked on grease naturally. It can also be used to soften water. Instead of paying companies like Harvey Water Softeners, you can just use a few slices of lemon. My favorite use for lemon, other than as a microwave cleaner, is to scrub my cutting boards with lemon juice. Not only does the lemon’s acidity disinfect the cutting board, it also rids the board of those yucky food smells with it’s natural citrus scent. Vinegar has to be one of my favorite natural cleaning fluids. There are so many uses for vinegar that if you ran out of every other cleaning solution and only had vinegar, you’d be fine. Add a little vinegar to your dishwasher instead of other spot removers for shiny, clear glassware. Add to your washing machine instead of liquid fabric softener for softer clothes. Vinegar makes a great substitute for unnatural window cleaners, polishes up tile really well, and can even remove build up from shower heads. It’s acidic so it disinfects really well. Vinegar’s only downside is that it doesn’t smell that great. If you want the nice smelling cleaners, use vinegar and add some nice smelling oils. Sugar is great to get rid of build up. Think of it as an exfoliant for fixtures and tough, baked on grime. This is another great thing to use when you are trying to get rid of baked on build up on metals. Use sugar and a very small amount of water to create a granular paste. Scrub at the object until the grime rinses away. For double action, use a lemon too. Don’t use sugar on anything that can’t be rinsed off, otherwise you will be left with a sticky film. Baking soda is a fan favorite. It gets rid of unpleasant smells really well, which is why many people have a box of it in their fridges and freezers, and sprinkle it at the bottom of garbage cans and bins. Baking soda also cleans metals really well, and is a popular way to clean drains that are clogged or even just need cleaning. It’s a great whitener, so you can add it to a load of whites if you don’t want to use harmful bleach. It also gets rid of grease staining really well from fabrics. Most of these things are easily found within the home already, and can protect the environment, your health, and your home’s balance. Have you used any of these in your home before? Do you know of any other natural cleansers? Great ideas Daisy! We need to get back to using more natural items to clean at our house. It seems like we use chemicals for everything. Of course, nobody makes any money off of a lemon, so we are trained to think that these everyday products can’t work. That is plain phooey! My wife does some of these around our house to save money as well as to not bring in the chemicals in the house. I did not know about the lemon though, thanks for the tip. My wife uses some vinegar-water mix for cleaning all our house. Windows, tables, counters, sinks… she does somethign with orange peels in it to make it smell better. But you know, at this point, the smell of vinegar means “clean” to me, so it’s no big thing anymore. We have spray bottles with a water and vinegar mixture all around the house. It’s responsible for probably 90% of the general ‘wiping up’ cleanup that we do, so much that I don’t even notice the smell anymore! I am a big fan of baking soda and vinegar. I use soda to clean silver items as well. Didn’t know about sugar, thanks for the tip. I’ve had quite a bit of luck with vinegar. 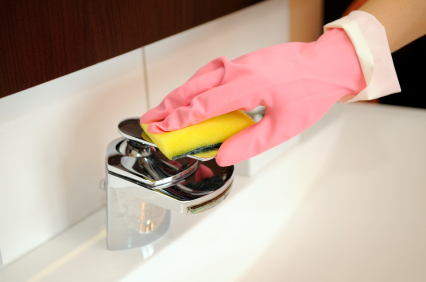 One thing that you didn’t mention is that vinegar is great for taking off lime or calcium deposits left by hard water. Apply vinegar, wait, remove with a paper towel. Being all natural, you can also use it to get said deposits off of fish tanks and not harm the fish. Yes, I spent several years being an aquarist in a place with very hard water. We use vinegar and water and sometimes lemon in the bottle for cleaning up certain messes around the house. It’s saved us money and we aren’t afraid to use it on anything which is a plus. Sometimes using products with chemicals can get scary especially when you know what they can do to our health. Baking soda is really an effective natural cleaner. It does not cause any damage to your place as well like the furnitures. I even use this to whiten my teeth. These natural green cleaning home products will make our house cleaning easy, as well as safe and nontoxic. We should opt for these cleaning products instead of those toxic ones.